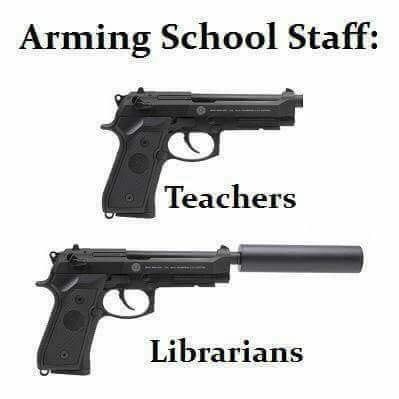 Thanks to reader Steve B. for the find. These pictures originated on FerrariChat.com, and I’m sure the poster that shared his photos did not expect the story to be cited time and again. The community of Shaniko is a ghost town with a colorful past, as it was formerly the leading wool exporter in North America. 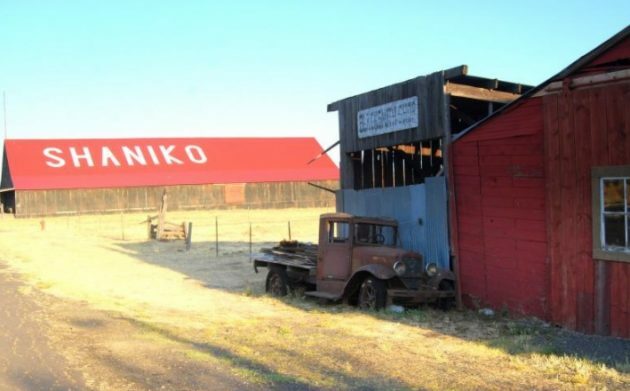 Like so many towns out west that went bust, Shaniko attempted to hold on by its fingernails by marketing itself as a tourist destination. I imagine the car museum was originally intended to provide the eye-candy necessary to get passers-by to stop in and visit, and at one time, these old dames must have been plenty eye-catching. The photos are quite old by now, but visits by photographers and urban explorers at later dates seem to indicate not much has changed. 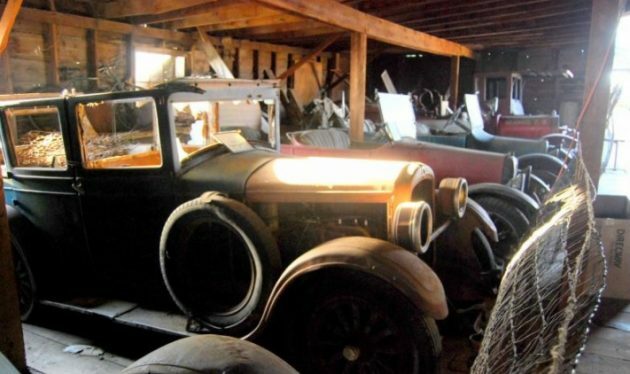 Some items of value have been pilfered over the years, but explorers like this one who visited in 2012 note that the cars are merely dustier and seemingly not vandalized, and no one seems worried about paying rent to keep the lights on (it’s OK, there aren’t any.) In this picture, that’s a vintage ambulance in the foreground and the beautiful Imperial coupe is the one I have my eye on, second from left. What else do you see? Here’s the outside of the museum, with another forlorn classic rotting away in front – but given the dry climate of the desert west, I’m not sure “rot” is actually a phenomenon that exists out here. The latest news report I can find from the Bend Bulletin indicates that a media magnate purchased the bulk of the community in the mid-2000s but had his plans go awry when the 26 or so remaining residents opposed his development goals. He cancelled his revitalization efforts while holding onto the properties, but I haven’t been able to determine if that includes the abandoned museum. Are any locals able to shed more light on the current state of the museum? I love reading these stories! 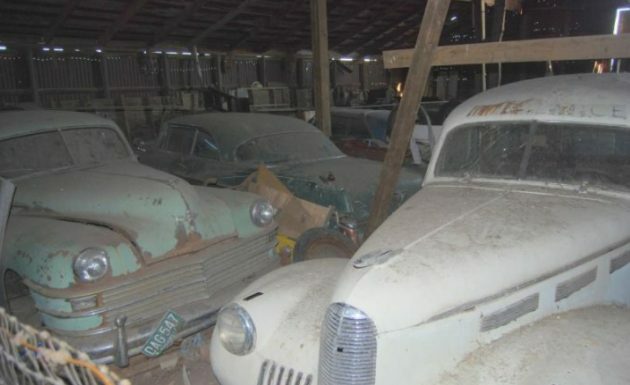 More old cars that will never be restored in a place that will never be visited. It’s a shame really. 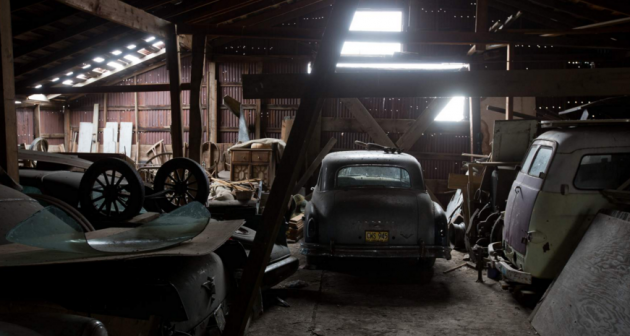 I’m a huge fan of American Pickers (even though, that too is scripted,,:0 ) and they come across these dusty car collections all the time. It’s just overwhelming, and they usually never make a deal. Most the cars just sat too long, and unless it’s really special, it’s mostly just cars that appealed to the original collector. I always wonder what eventually happens to these defunked collections that nobody wants. This sounds like a great road trip! My spouse has agreed to a destination of my choice for a jaunt, or perhaps someone from the museum will want to go. We’ll see! Too bad this place could not have capitalized on the Eclipse seekers. The green car on the left reminds me of my 1941 Chrysler Windsor. White Ambulance is a 1940 La Salle, last year of production. Just a bunch of junk cars that are not worth S**T.
Wow…. Who pissed in your cereal this morning? Michael, please refrain from visiting this site if you have zero appreciation for old automobiles, which indeed appears to be your inclination. You are being painfully ignorant. One man,s junk is another man’ treasure. I have heard of a collection in a small southern Indiana town supposed to have 40-50 cars of considerable value. I’ve also heard of people with any where from 4-20 vehicles squirreled away. Many of these will not see the light of day until the owner dies. Then the heirs will see huge dollar signs and join the ranks of those unrealistic sellers who get trashed on this site. The stuff in the background of American Pickers is often more interesting than what they pick. Just like some of the pictures we see here. I’m in for the fantasy and the nostalgia. Barn Finds does a great job of providing both. Well said ccrvtt. But I disagree with the previous post, you can’t really see enough of the cars to consider them junk. I see a couple old roadster looking cars that might be desirable. Fantasy and nostalgia? YOU BET. In every barn. There are some real gems in the collection, but as the others have said, pricing will be OTT when the stuff finally goes to market. her driving that beast even though she could barely see over the dashboard! Lots of projects there. Wished I had the cash to buy one. Car production wasn’t pinched off until early 1942 in the US. 1941 would have been a full model year, running from fall ’40 to summer ’41. Have been there many times, never a sign of a human being around. The history alone that these gems hold is priceless! Heck, show me a junk yard, I’ll make a day of it! Reminds me of my barn…. Let’s see your barn Gary Fogg, Come on now, don’t keep all of us in the dark after that comment. Got any white 2door coupes I’d pay minimal value lol. No one will speak about the 1919 Studebaker? looks cool. but who to get in contact with? My wife and I started driving through Shaniko over 40 years ago travelling to and from college and our house…and later trips through the town…they looked the same all this time! Also, there’s a large old hotel in town (and a gas station and not much else). Anyway, I know an insurance lady who had to stay overnight in Shaniko just a few years ago while visiting clients out on the area farms, so got a room in that hotel. As far as she knows, she was the only one registered in that turn-of-the-century 4 story Shaniko Hotel. It was clean, but very old and creaky. So, when it got to be about 9:30, the desk guy came up and told her that he was leaving for the night, so she would be the only one in the building until about 7:00 in the morning! However, no worries, because he would lock the front door. She said she just about spent the whole night on her cell phone (yes, she actually got coverage!) with her husband back in Portland. Last I heard, she has not chosen to be in the Shaniko area visiting clients any time after about noon! I know the hotel you speak of and have some beautiful photographs of it. Your friend could have continued south to Redmond or north to The Dalles easily had she not wanted to stay in Shaniko. Bet she coulda had some great Ghost story’s,,,,Or even better maybe the Ghosts coulda told some good ones as well. Maybe join Jack Nicholson down in the bar like in the Shining. Sadly, the hotel closed several years ago. I have driven up and down 97 many times over the years and somehow never noticed it. Now, for a 10-hour slog up 5 and 97. I understand you can still look in the windows at the cars. I grew up in Bend, went to Shaniko for a Junior High field trip. The museum was open then. About 1975 or 76. Shaniko is not that far from me, I live near Portland Oregon and have driven thru there many times, We have family that lives just south of there and its amazing area, Shaniko is just south of “Bake Oven” no joke,, and bake it does in the summer, But Its also just north of Antelope and THAT place has some history as it was home to the Rajneesh compound and cult in the 1980s, Several remote communities have been bought up so rich guys think they can do whatever the hell they want, Did not work out so well for the guy who owns all the Shilo inns hotels, One of the most hated people in Central Oregon. Even the State Police raided his ranch for poaching and game violations as well as a few other offences. Be careful who you piss off, its a very remote area and you could just disappear. That Shilo Inns guy was a serious POS, they kept a bowl of hunting tags and feel free to go poach anything you like, If you wanted you could use one of the tags, but most times they didnt bother. He tried to run off the locals as well, Didnt like to see their run down houses on the way to his ranch. I’d be interested in the Dodge Town Wagon. 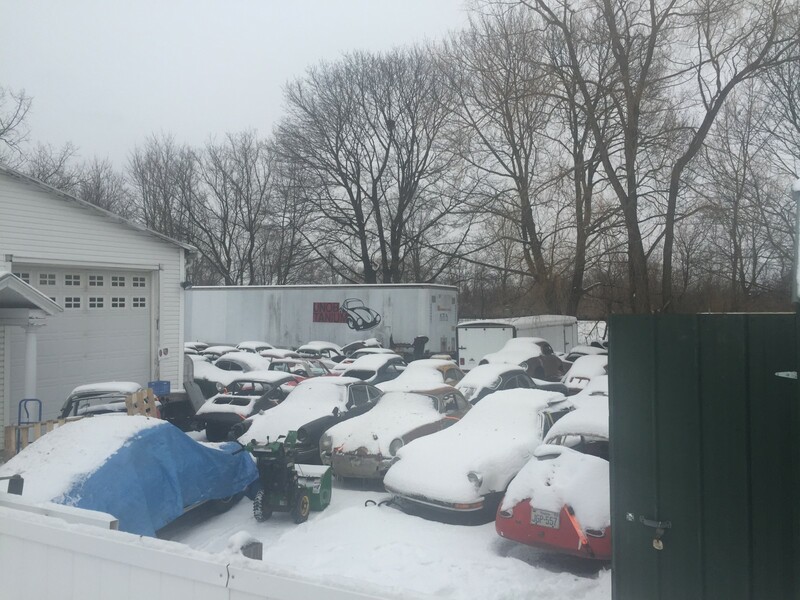 Large stashes are still out there, I did a 50 car Porsche deal a couple of years ago, mostly 356’s. Finding them is only half the battle, then you have to buy them. Watch out for Matt Dillon, he might tell you to get out of Dodge. You know they built Dodge cars for women, they put a sign on the front warning other drivers to Dodge. he, heh, heh. Interesting story. I always find it sad when I hear about the family holding out for top dollar on cars left behind by a collector. All they (think they) know is what the deceased told them. Often they don’t care to hear the truth. Then the cars just sit there, waiting for someone else to pass on…. I have a connection to EMT, so I find the ambulance kind of appealing….